Share the post "5 Common Questions About Fibroids"
Read here to learn about 5 common questions women ask about fibroids. Take this list with you to your next Ob-Gyn visit! 1. What is the size and location of my fibroids and can the fibroids affect my fertility? The size and location of the fibroid has the ability to greatly reduce your ability to conceive or not at all. The primary issue that is greatly considered is whether the uterine cavity is distorted, which can cause it to interfere with an embryo’s ability to implant and thrive. Your physician can find out this information by carrying out some diagnostic tests which reveal this information. 2. If fibroids run in my family should I plan to have children sooner? Across the board, most physicians will agree that it’s always wise to have children sooner rather than later because a woman’s age plays such a significant role in the quality of her eggs and potential complications during pregnancy. Because fibroids have the ability to affect conception and can possibley even cause miscarriage, one may be better off planning child birth sooner, rather than later so as to avoid additional complications that may arise. Hysterectomy is a method that completely rids your body of fibroids by having your uterus removed. However, this procedure also shuts the door on future pregnancies and requires hospitalization, as well as six to eight weeks for recovery. Uterine artery embolization is a popular alternative that typically involves only one night in the hospital and a week of rest. It is a less invasive procedure that is optimal for women that want to experience the benefits of fibroid treatment without having to spend extended periods for recovery. Myomectomy, or removal of the fibroids while leaving the uterus intact, is another treatment for women trying to get pregnant, but it carries a risk of recurrence, and its effect on fertility hasn’t been studied. Currently, these procedures are among the most practiced for the treatment of fibroids; however, you may ask your doctor about additional treatment options that you may also find favorable. 4. How can I tell if I really need treatment? 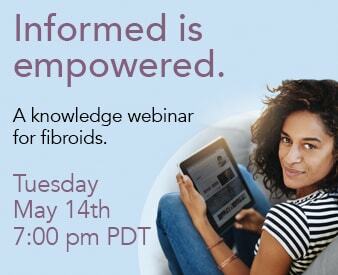 Diagnostic tests are more refined than ever in measuring the size and location of fibroids and helping your physician to predict their effects. Additionally, you may also want to do some “soul searching” so as to gauge how severe your symptoms are and whether or not they are affecting your quality of life. If you find that your symptoms are posing as an impediment, you may want to look into treatment. 5. What is the risk of my fibroids growing back with each procedure? Fibroids can recur, unless the uterus is removed, and the risk varies slightly with each of the new procedures. Learn more about Uterine Fibroid Embolization online, or contact us directly by calling (800) 645-6095 or by requesting a free phone consultation.